A council member who was not authorised to speak with the media confirmed to correspondent that the meeting would take place as scheduled. Meanwhile, the Coalition of United Political Parties (CUPP) has again raised the alarm on an alleged plot by the federal government to use security agents to lock down the National Judicial Council (NJC) Headquarters and intimidate members at their resumed sitting today. The coalition alleged that the government was working with acting CJN Mohammad to manipulate the NJC meeting after majority of members allegedly refused to be compromised to support the removal of Justice Onnoghen. The CUPP spokesperson, Mr. Imo Ugochinyere, said they obtained credible intelligence with evidence that a combined team of security agents has been approved by the presidency to cordon off the venue of the NJC meeting scheduled for today as they proceed to consider the answers to the queries issued to the CJN and Justice Mohammad. 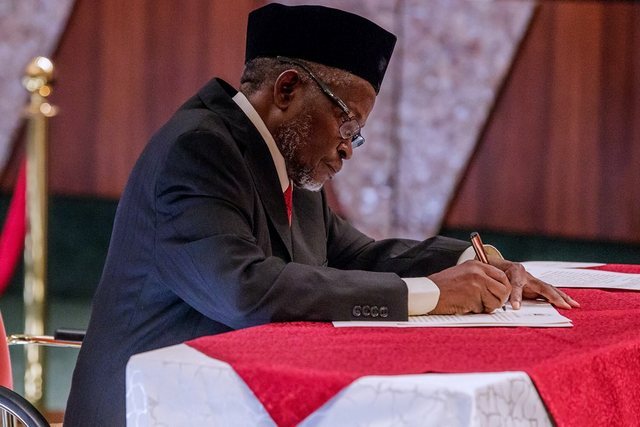 He said: “The operatives have been handed instructions that they should do whatever is necessary to ensure the NJC indicts the CJN and set Justice Tanko Mohammad free from all allegations.” He also alleged that an Assistant Inspector General of Police and another very senior officer from the Department of State Security (DSS) are to coordinate the operation. This latest decision, he said, was informed by the fact that the federal government is aware that the Nigerian opposition has obtained further evidence to prove that the removal of Justice Onnoghen from office by Buhari is merely for political purpose, having failed in a bid to recruit the CJN to support the APC and use the office of the Chief Justice to unduly favour the party and the president in the post-2019 Supreme Court election petition appeals. The CUPP urged Nigerians to keep vigil over the venue so that the last hope of the common man is not conquered. Ugochinyere also urged members of the NJC to resist the invasion by those he described as political barbarians and sack Justice Mohammad from the bench for conniving to breach the NJC guidelines and the 1999 Constitution as altered. “The plot to use security agents to attempt to intimidate members of the NJC is reprehensible, condemnable and repugnant and must be dismantled immediately as continuing with it will be one abuse too many in a constitutional democracy,” he said. Also, the CUPP has claimed that it was in possession of purported draft resolution of the NJC allegedly handed down to the Acting Chairman of the council, Justice Umaru Abdullahi, for possible adoption at the end of the meeting of the council today (Monday). It alleged that the compromised draft resolution contains the decisions that the suspended CJN, Onnoghen be forcibly retired, while Justice Tanko Muhammad be confirmed and his name recommended to the President for confirmation as the substantive CJN. The CUPP spokesperson, Ugochinyere, at a press conference in Abuja, said the draft also contained the defence for Justice Muhammad that as at the time he made himself available in the Villa to be sworn in as acting CJN he did not have much of a choice as security operatives were detailed to bring him to the Villa on his way from the mosque, and that he was only told why he was brought to the Villa when he was already in the Council Chambers. He said, “Nigerians will recall that this same Justice Abdullahi was one of the first persons recruited by President Buhari to defend his controversial Certificate saga by claiming that Buhari wrote the WAEC exam. He urged Justice Abdullahi to step aside compromising the meeting and decisions of the NJC and receiving a draft copy of resolution from the Presidential Villa. “The precedent of the decision of the NJC as was used in the case of Abia State has been excused and Justice Muhammad absolved of any collaboration with the executive to violate the constitution. The bridge of the NJC and the entire judiciary is at the brink of falling. “We shall continue to do all within the ambits of the law to defend our constitutional democracy and we must not wary,” Ugochinyere said.